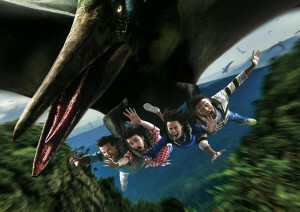 Passengers will hang in the clutches of an enormous Pteranodon dinosaur, as it turns 360 degrees in the air and flies at great speeds, revealing the world of Jurassic Park below. The feeling of exhilaration and the surreal environment featured in this attraction are a great way to relieve stress brought about by daily life. Universal Studios Japan “Bringing you the best of the world.” That’s the motto it has built its reputation on, and continues to reinforce, with large, exciting projects such as this new roller coaster, promising to bring a remarkably thrilling experience to guests as a way to commemorate its 15th anniversary. Universal Studios Japan’s 15th Anniversary will be one to remember! * Based on company research of the 22 flying roller coasters in operation worldwide. Roller coaster’s total length: 1,124 meters, with a first drop of 37.8 meters. The Flying Dinosaur was made possible in cooperation with our corporate marketing partner, JCB Co., Ltd. This entry was posted in Home Page, Home Page Slider, News and tagged Jurassic Park, The Flying Dinosaur, Universal Studios Japan. Bookmark the permalink.